This Trek will take you through West Sikkim. DAY-01- Arrival at nearest Bagdogra Airport or New Jalpaiguri railway (train) Station transfer to Kurseong about 90 kms, 2 hours drive by luxurious vehicle. Arrival at Bhadrapur / Biratnager Airport (Nepal) transfer to Kurseong about 4 hours drive by luxurious vehicle. A journey to Kurseong is beautiful experience. The road passes through lush green forest, teagardens, mountain views, water falls, Mountain River and more. A complete journey to Kurseong a delightful experience simply out of the world. Kurseong (1486 m), it is nearest hill station, a picturesque tourist resort, it provides excellent view of the southern plains. Kurseong enjoys a milder and very healthy climate throughout the year. Over night at hotel in Kurseong. DAY-02- Drive from Kurseong to Yoksom (1700 m) 75 kms, it will take 4 hours drive. It was the first capital of Sikkim, according to the historical records. 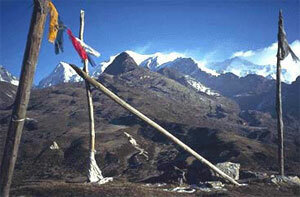 For adventurous and lovers of nature Yoksom has an altogether different meaning as the trek to Dzongri begins at Yoksom. The base camp for mountaineering expeditions also begins at Yoksom. Lunch at enroute. O/N at hotel in Pelling. DAY-03- Trail from Yoksom to up hill Tshoka (3050 m) 16 kms, 7-8 hours trek. The trail now runs through rich wooden hill abounding in flora and fauna, going as it does through moss- laden forest of Oaks, spruce, chestnut pines and giant magnolias and rhododendrons, a botanist’s paradise. Not to be out one, the naturalists can view hundreds of varieties of exotic birds. Among the animals are Himalayan brown bear, black bear, barking deer, musk deer, red panda and more are found here. Lunch enroute and over night stay at Tshoka. DAY-04- Trail from Tshoka to Dzongri (4070 m) 10 kms, 6 hours trek. Each steep step to Dzongri leads to the world of the famed Kanchanjunga massive. The steady and demanding climb passes through gullies laid grazing yaks and mountain sheep through Tsoka. Straight ahead is the third highest in the world- the legendary Kanchanjunga, it worth the excellent and imposing view one gets of the Kanchanjunga along with the colorful rhododendron flowers. Lunch enroute and over night stay at Dzongri. DAY-05- Sight seeing around Dzongri area, over night stay at Dzongri. DAY-06- Return trek from Dzongri to Tshoka, 10kms, 5 hours trek, lunch at enroute and over night stay at Tshoka. DAY-07- Return trek to Yoksom, 16kms trek, 6 hours, lunch at enroute, at Leisure. (End your trek). Sights visit Holy Khecheopalari Lake, on the way to Pelling, it is considered to be one of the sacred lakes, and the lake remains hidden in reach forest cover. It is believed that birds do not permit even a single leaf to floating on the lake surface. O /N stay at Pelling. DAY-09- After lunch drive to Siliguri plains, (which is nearest for all the modes of transportation) over night at Siliguri.